"George was one of the finest, honest and all-for-the-organization gentlemen we had." Those words from Cavaliers founder Don Warren summarize the opinions of many who knew George Bonfiglio, co-founder and long-time director of the 27th Lancers who passed away last Friday. It's always tough to lose part of our collective drum corps history. I remember George as a loveable giant, sort of our equivalent of Ed Asner's Lou Grant character from the Mary Tyler Moore Show. He exuded enough charm to light a football field. Always friendly and eager to chat while at the DCI World Championships, he was a living connection to our past and a cheerleader for our present-day kids and corps. Talking to a number of former 27th Lancer members over the years, it was apparent that everyone who came in contact with George idolized him, perhaps because he seemed to idolize the members in return. They were each part of his personal family; often over to his house as if it was theirs, calling him years after they marched to share news of the births of their children, checking up on him just to be sure part of their extended soul was still okay. If you found George in the press box at the DCI Finals, you didn't have to look more than a couple feet to find his late wife, Patsy. They were almost one person, and their combined love of the members of 27th Lancers filled the hearts of the members with a glow one doesn't find in every corps. 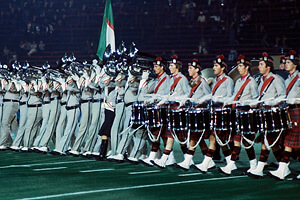 After the corps' last season in 1986, George mentioned it was best to go out without looking back because it was in the best interest of the members. Their tour buses were getting too old and George didn't feel he could get the corps down the road properly without compromising the safety of the members. There were other factors as well, and everything added up in his mind that the kids would be best served if they had a chance to go somewhere else. He didn't want 27th to be hanging on for the sake of hanging on. For so many years, he and Patsy kept the corps afloat any way they could. David Kampschroer, co-founder and former director of the Blue Stars, says that George "was the textbook example of doing-it-right with limited resources. His organization identified with him and his wife. The office was their dining room table and the memo system were notes applied to the light over that table." DCI Hall of Fame member Bill Howard, former director of the Madison Scouts, remembers George as being "extraordinarily dedicated to his corps, personally providing financial backing when needed." Kampschroer recalls George and Patsy as the "front cheerleaders in the east for the formation of DCI," and as such, he was selected as DCI's first chairman of the board of directors and used his influence to unite the eastern corps. Warren remembers, "He did so much for DCI. He was a wonderful, sincere man who loved drum corps and was all in favor of moving forward." Howard says, "George was willing to trust people who weren't from the east. He was an early supporter of the concept of DCI and was helpful in providing credibility to DCI's formation." Howard remembers that in order to strengthen the influence of DCI, George was willing to have his own corps take a substantial financial hit by not performing as part of local shows that did not adhere to the fiscal and scheduling conditions set by the DCI corps directors, adding, "In the spirit of cooperation, he gave up a significant advantage to build up the strength of the DCI. By his actions, he was able to influence others in the east to work for the common good." Tim Stambaugh, a member of Crossmen in 1977 and 1978, emphatically said, "all who march in a DCI corps have benefited from George's help." Jeff Perkins, former director of Avant Garde, believes, "The entire activity owes its continued existence to George B and others like him for their foresight in providing a place for competitive drum corps to survive. We will never forget him." Another former DCI director, John E. Jones, directed the De La Salle Oaklands and Oakland Crusaders. He was in the 1971 meeting in Indianapolis when DCI was formed. As a 22-year-old director, he looked up to the likes of Bonfiglio and the other longtime directors who were now venturing into the great unknown. "When I attended my first DCI meeting in Indianapolis … I was scared out of my boots to be in the company of names like Jim Jones, Don Warren, Gail Royer and George Bonfiglio. George paid special attention to me, made me feel welcome and treated me like my opinion was important. "A couple of years later, when the De La Salle corps was struggling financially and competitively, I was sitting on the grass at a stadium in Atlanta. I felt a hand on my shoulder and looked up to see George smiling down on me. He spent a few minutes speaking to me and somehow made me feel that things were never as bad as they seemed. He had that ability to make you feel better because he cared." Billy Newman joined the 27th Lancers as a 16-year-old, just two weeks before the corps was to travel to Miami to play the halftime show for the AFC Championship game. "Before we took the field, George told me to act like a Lancer and everything else will fall into place. Over the next three years, I learned a lot about being a good person." The genuineness of George Bonfiglio is something that is mentioned in some way by everyone that knew him. Don Warren remembers that when his wife and her sister were visiting Boston, Don called George to suggest a good hotel. George instructed Don to have the two women call him when they were in town. When they did, they ended up at the Bonfiglio house, where George and Patsy had prepared a full lobster dinner. Years later, in 2008, George came to Chicago to attend Don Warren's 80th birthday tribute on the occasion of the Cavaliers' 60th Anniversary. Warren reflects on George's passing with, "I lost a good friend." The entire drum corps activity has lost a good friend. But the entire activity is better for having had George as one of us.